FM Global Logistics is a leading international LCL and FCL freight services provider. As a specialist in ocean-going freight transport, we offer both export and import freight services for both LCL and FCL shipments of goods. Together with our strong network of international offices and agents located at all major seaports, FM Global Logistics is able to ensure efficient and quality shipping of our customer’s cargo. FM Global Logistics is able to provide a reliable FCL service to our customers with our complete logistics facilities and assets. Our customers will also benefit from our preferential rates and space commitment from various shipping lines. As a group, FMGL ships approximately 140,000 teus annually. Less Than Container Load (LCL) is a term which describes the transport of small freight shipments which do not require the full capacity of an ocean container. Usually the load is made up of less than 20 CBM (cubic meters). With our team of experienced personnel and a fixed scheduled LCL service, FMGL is able to provide a reliable, efficient and cost effective LCL service to our customers. As one of the leading LCL service provider in the country, FMGL have our own direct consolidation with multiple weekly sailing to/from all major ports worldwide. We also operate our own CFS facility with our own personnel and equipment in Port Klang to ensure your LCL shipments are handled carefully and with the highest security standard possible. FMGL handles approximately 600,000 cbm of LCL shipments yearly. FMGL offers direct LCL (Less Than Container Load) and FCL consolidation to the major ports of Sabah and Sarawak. Through a network of 107 reliable agents in 127 ports, the Group is able to offer quality and dependable services to its customers to meet their logistic needs. 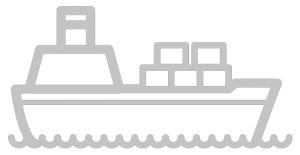 The range of sea freight services include port-to-port, port-to-door, and door-to-door deliveries.